„Suggestions are not provided because most attendees are not available during your working hours.” – is one of those messages you look at and think.. this is weird. It was working yesterday. After a longer while verifying settings on Exchange, spending countless hours looking for solution…we have finally found what the problem is…. Turns out in our case it was just pure choice of days. We were trying to schedule a room on a time that's in the past already or outside of working hours for that day (hence grayed out on the calendar). 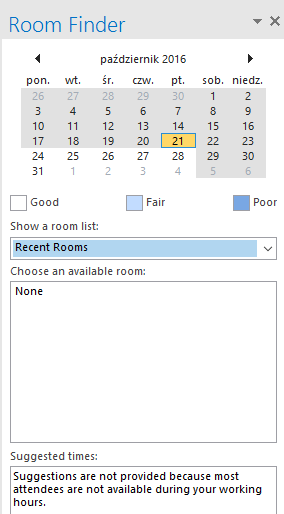 After choosing proper day / time we were able to find the rooms on the list. That was one obvious fix… that sometimes can give you headache.